IVT BlueSoleil 10.0.496.1 Multilingual ~ Apps2Portable | Free Portable Apps for PC ! 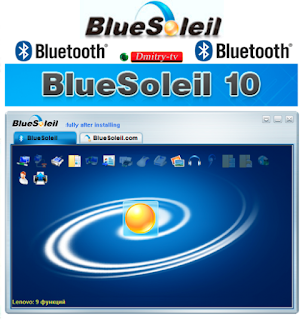 BlueSoleil 10 based on BlueSoleil 9's features takes advantage of Bluetooth 4.0 low energy technology and is Windows 8/8.1/Windows 10 compatible. BlueSoleil 10 has improved functions and optimized performance. BlueSoleil 10 is one of the most popular professional Windows-based Bluetooth applications, developed by IVT with great innovation and independence. Bluesoleil is able to fulfill demands of integrating a diverse array of Bluetooth enabled digital devices, such as mobile phones, headsets, printers, keyboards and so on. You can also establish networks and exchange data with other Bluetooth enabled computers. Aren’t you tired of tangling wires? BlueSoleil 10 presents a new wireless Bluetooth experience. You can view and manage your contacts in your mobile phone from computer and backup your contacts wirelessly via BlueSoleil 10. You can easily type long messages directly from BlueSoleil messages dialogue. You can transfer files, photos, music, videos and any other data wirelessly. Meanwhile, you are able to connect with other people via BlueSoleil 10. It is a worthwhile and user-friendly tool that you can share with you family and friends. When you own BlueSoleil 10, you can get BlueSoleil cPhone (Cell Phone Wireless Management Expert) FREE at the same time. You’re bound to take BlueSoleil 10 home, aren’t you?